One thing that became abundantly clear as I started looking at January races is that, in the Northeast, New Year’s Day runs were going to be by far the best bet. If I had been unable to go today, it would have been 50/50 and pick ‘em whether I could have found a race to run this month. Guilford, Connecticut, sits on the I-95 corridor just east of New Haven and right on the Long Island Sound. I knew nothing about it when I registered – I picked this race because it is relatively large for one of these (probably close to 1,000 runners, including the kids fun run) and they’ve been doing it for years. So at least they’d have their ducks in a row. As it turns out, Guilford is an absolutely beautiful town. We started and finished at the large town green, which is surrounded by old colonial style buildings filled with shops, restaurants, etc. 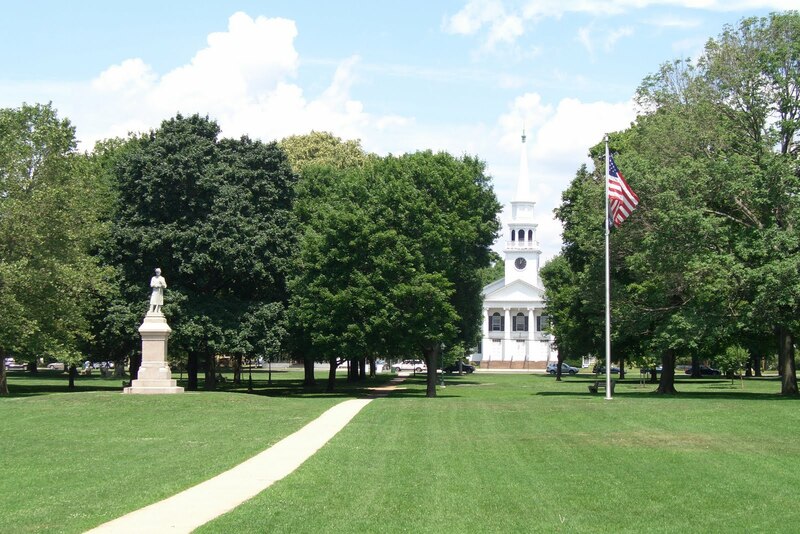 Everything about this town was charming as hell – Guilford, Connecticut, acquitted itself quite well to anybody that drove in for the race. This was my first 5K since the PR at the Celtic Classic in September … and though I don’t feel as strong now as I did then, I hoped that I might have a reasonable shot at a PR here, and, with some luck, at the 30 minute barrier. The temperatures were predictably cold – 25 degrees or so at the start – but they did start it at 11am, so it could have been much worse. 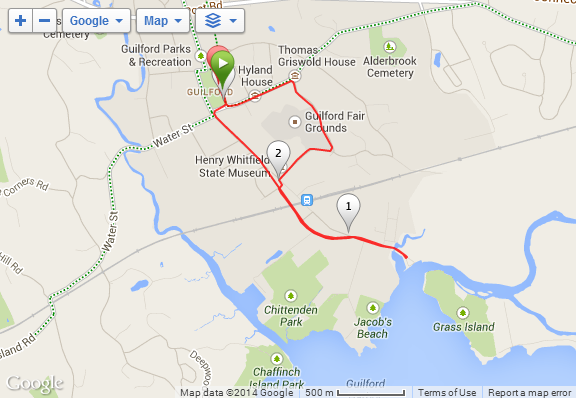 The course itself was a big loop with a little out-and-back spur down to the water. Things were mostly flat – the one “hill” was a bridge over train tracks, and there was a 40 – 50 foot climb in the last mile. Nothing major. Mass confusion at the start – the megaphone wasn’t working, so nobody could hear anything. Somebody sang the national anthem, but unless you were in the first third or so of runners you couldn’t hear it – most didn’t even know it was going on. Then the guy raised his hand, counted down, dropped his hand, and we were off. My intention was to set off comfortably too fast (if that makes any sense) and work to hold it. And initially that plan worked great. My first mile came in at 9.39, which is the fastest official mile I’ve run since high school. Which was great. The second mile came in at 10.07 – which was less great – and it was at about half-way when the wheels came off. For the bulk of my running “career,” my shins have been a problem. Most of this is weight and pronation control related, but I haven’t always known that. Years ago, in my first little attempt at running, shin splints forced me to stop. And when I started this time the most difficult part was managing through the initial pain in my shins. However, after that first 6 to 8 weeks, things eased up and the only time I’ve had a problem is if I’ve taken more than 2 or 3 days off between runs. Well, at around mile 1.5 of this 5K my left shin tightened up and hurt like hell. And I couldn’t make it relax. The rest of the run was one of the more acutely painful I’ve done in a long time. At first I was mystified – what in the world might be causing this? Slowly it dawned on me what the problem was … I hadn’t warmed up adequately. See, when I do my training runs I deliberately use the first mile as a warm-up mile and hold back. Even on my short runs. Almost always, mile 3 or mile 4 is the best mile for any run that goes that long, because I’ve had a chance to warm up. Well, this time, I took off fast right out of the gate and didn’t give those muscles a chance to ease into it. So … live and learn. From a high-level perspective, I’m happy with my overall time – 31.42, a 10:18/mile pace. Splits were 9.39, 10.07, 10.54, and then 1.03 for that last tenth of a mile. Plus I got a mid-week run in in a fun way, and got to see a cool new town in coastal Connecticut. Happy New Year! – I’m struggling to dress in the cold. Especially in these situations where I’ve got to kill some time out there, I want to make sure I’m adequately layered. But I’m finding that I’m getting too warm by the end of these runs / races. Though today was cold enough that by the time I got back to the car my sweat had chilled and it took a hot shower to get me warmed back up. I’ll keep tinkering with the layers, though, and eventually get it right. 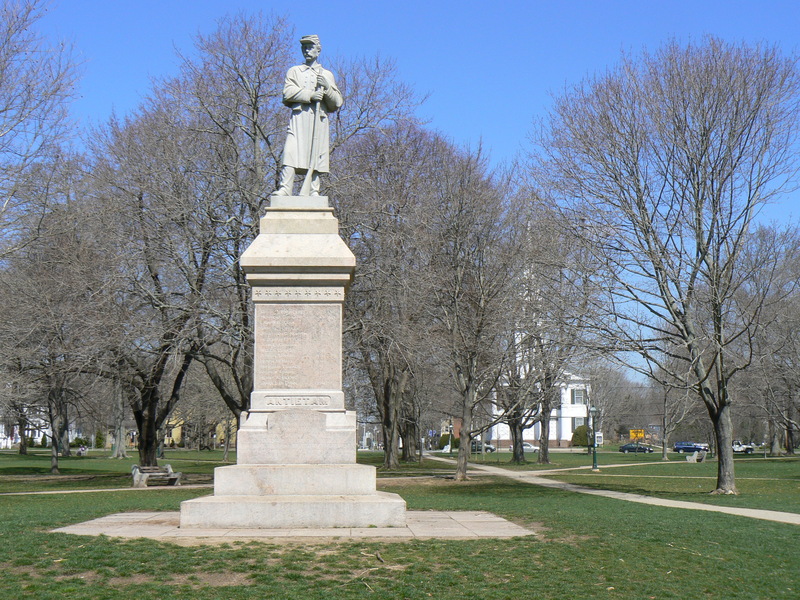 – Always Read the Plaque – that’s what Roman Mars would tell us – and so when I saw a big monument in the middle of the town green I had to go over and take a look. Turns out, it was a big Civil War monument, listing the names of all of the soldiers that died in the war from Guilford. I have always been fascinated by the Civil War, and as a Southerner have obviously seen my fair share of monuments. However, outside of New York City (which is loaded with them), I’ve seen very little of that up in the Northeast. This was a quite interesting find – and somebody had placed a holiday wreath on the statue soldier’s arm. – The little out-and-back was deceptively short – I’m now accustomed to much longer runs than this – so it was a little jarring when we met the leaders when I was only at about mile 0.9. BUT – they were only at about mile 1.5 or so. – There was actually packet pickup for this race at a local running store for the last couple of days, so I think many people did that. Because I only did it on race day, I got no SWAG except the t-shirt, which was a nice blue long-sleeved cotton job with a tastefully understated logo on the front. I like getting shirts I might actually wear out. – That was January – the streak is now at 11 months. I’m registered for races through May, so no end in sight. I found your blog here completely by accident, searching for something about this race. I just wanted to say I was stoked to read your blog post and see the running and weight loss journey you are on. I truly and sincerely find it inspiring. Of course fast times can inspire, but for me it really is all about the journey. Who is working hard. Who really wants it. Who is struggling but persistent. Who is overcoming obstacles. Who is enjoying it despite all the struggle. I am motivated by being around athletes of all ages, genders, fitness levels, as long as they are WORKING at it. Are PUSHING themselves to be better. I’ve also had struggles with my weight and running for a lot of my life. Thanks for sharing with everyone through your blog. You never know who might read it and be motivated by it. I also happened to have won the race that day in Guilford, so I really mean it. Hope to see you out at the races again. Cheers! So … thank you very much for that. The last 6 – 8 weeks have been rough, but it feels like we’re actually emerging from this never-ending winter. And I’m optimistic. And comments like yours are incredibly motivational and helpful. Thank you, and congratulations on that win. You seriously could have nearly run the race twice in the time it took me to run it once.